It’s hardly surprising that Pixar, the pioneering studio that helped make computer animation a part of our cultural life, has produced an extremely creative movie. Sometimes, it’s good that our expectations are met, and this time, Pixar hasn’t let us down. A long way from disappointments such as Cars 2, (2011), Pixar’s Inside Out tells a story based on the idea that we all have a variety of voices rattling around our heads, the constant conversation that represents one of the last bastions of privacy. 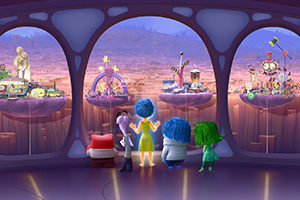 In Inside Out, director Pete Docter (Up) takes us inside the mind of an 11-year-old girl, showing us how she reacts to a major and very stressful development in her life. The story revolves around a big adjustment Riley (Kaitlyn Dias) must make. In search of a business opportunity, Riley’s parents (Diane Lane and Kyle McLachlan) move from what Riley sees as an idyllic Minnesota town to San Francisco. Forced to adapt to a new school, a new urban environment and a house that’s in need of substantial work, Riley’s head goes into spin cycle. That’s hardly a novel idea, but what’s unusual about Inside Out is the imaginative way that Docter brings Riley’s conflicts to life. He creates characters that represent Riley’s major emotions, and allows one or the other of them to take over her mind as circumstances change. These “inner” characters have self-explanatory names: Joy (Amy Poehler), Fear (Bill Hader), Anger (Lewis Black), Disgust (Mindy Kaling) and Sadness (Phyllis Smith). You get the idea: The story takes place both inside and outside Riley’s head. We see how Riley’s emotions react to shifting circumstances. Should we be surprised that Anger raises its voice? At one point Joy and Sadness leave the control room (the place from which all the emotions are governed) and have adventures inside Riley’s mind, encountering great banks of long-term memory archives. When Joy and Sadness leave the control room, Anger, Fear and Disgust take over. Not a happy occurrence. Docter’s animated feature has a welcome undertone of psychological realism: Sadness can interrupt Joy, and the movie smartly riffs on the way memory works. At one point, the story dredges up a memory of a nearly forgotten imaginary friend of Riley’s named Bing-Bong (Richard Kind). Maybe she forgot about him when she became involved in hockey, her favorite sport. Visually, Pixar’s computer geniuses keep pace with the story. There’s plenty to keep the eye busy, but the real message here has a salutary grace. In order to function, Riley doesn’t need to abandon Anger, Fear and Disgust; she must learn to find the harmony that makes room for all her emotions while preserving her core values. That may sound a bit pat, but — as we all know — it can be easier to balance a check book than to balance our emotions. Don’t believe me? Just ask Anger and Disgust.